Growing up my best friend Kano was half Japanese, and one of the best parts of going over to her house besides playing NES, eating homemade sushi and getting to watch rated R movies, was an endless supply of Pocky. After dinner her mom would hand us our own personal box and we’d go off and watch “The Crying Game” or “Blue Steel”. Really appropriate for 10 year olds. I think I was scarred for life. Moving on. To relive my childhood AND review Omnivore 100 item #83, I traveled to the Oriental Market in Rockville, MD and was surprised to find a large selection of Pocky flavors. I had heard rumors of these varieties but I had only tasted the original 1966 chocolate flavor. I was definitely a Pocky purist/snob, and sneered at the alternate flavors, daring not to taint my clearly refined palate. However, as much as I tried to deny it, some of the flavors were tempting. While Omnivore item #83, in its purest interpretation, really only covers the original Pocky, I think I’d be doing you, the WeLoveDC reader, a disservice in not reviewing some of the other flavors. Or at least that was my rationale behind cheating on my first Pocky love. So to ease my guilt, I’ll say I did this for you. Straying from my moral Pocky conscious was purely a selfless act. I took one for the team. I hope you’re happy. Pocky Original: My love for the 1966 Pocky continues with a passion. These small chocolate covered biscuit sticks taste similar to chocolate covered pretzels, offering taste buds a sweet and salty contrast that is delectable. Crisp. Light. Refreshing. And calorie conscious too! A perfect snack. Eat by themselves or pair with an after dinner espresso. You can enjoy them whenever no matter the season. Coconut Pocky: I’m not a big fan of coconut to begin with, but this Pocky variety tasted more like German Chocolate Cake frosting than a full blown pina colada. The biscuits are covered with coconut flakes and a semi-sweet chocolate. This was my first rough textured Pocky experience, and it was a pleasantly surprising one. While this flavor tasted good, I didn’t think the coconut offered much difference from the original. Strawberry Pocky: On opening the packet, I was overwhelmed by the nauseating smell of Strawberry Nesquick. Yuck! And the Pocky tasted exactly as smelled. I’m always disappointed when food companies create “strawberry” versions of their products, because they usually fail miserably at even coming close to the delicious natural strawberry flavor I love. Definitely pass on these. Almond Pocky: Textured like the coconut Pocky, upon tasting I immediately tasted a slight burnt flavoring that quickly disappeared and turned into a nutty, roasted peanut-like taste. Nuts and chocolate are always tasty in my opinion and combining them with a slightly savory biscuit only enhanced the flavor. My only complaint was that the almond flavor was pretty much absent. Men’s Pocky: I’m not really sure why this dark chocolate flavor is labeled the “Men’s Pocky.” I know many a lady who crave dark chocolate. There was, as expected, the slightly bitter taste of the antioxidant-rich chocolate and it left a lasting smooth, indulgent flavor. Definitely tasted more upscale. 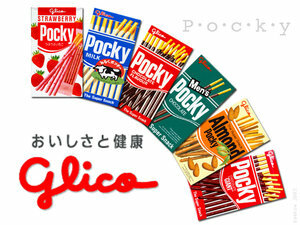 In summation, after my foray into Pockyland, I’m still a purist at heart; Pocky Original is just too good to forego. You can’t improve upon perfection. Pocky is such good stuff. Ever had the mousse flavor? That’s my favorite! I have not tried the mousse flavor, but will keep my eyes out for it. Sometimes I think Pocky sticks are just a big tease. They should make gi-normous Pocky sticks to satisfy my chocolate-biscuit cravings. Next you’ll be telling me that you’re not supposed to eat the entire bag of microwave popcorn by yourself, Jaime.